I get SO many views on this blog now, like SO many. But most of them are from horrible spambot things that are set up to make the ‘referral’ link some dumb, virussy webpage, so I click through to them, intrigued by the sudden swell in traffic. So really, my blog is nowhere near as popular as spambots would lead me to believe. This upsets me a tiny bit. 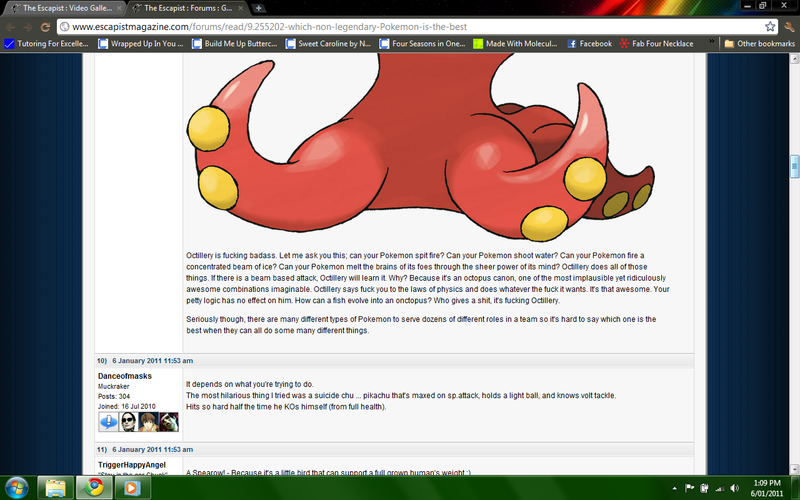 Here, have a screen capture from a thread on Escapist, I believe, about how cool Octillery is. Click to read the hilarious text. I’d link back to you, Octillery-fan person, but I cannot find where this thread was any more. Know that you have my love and respect.